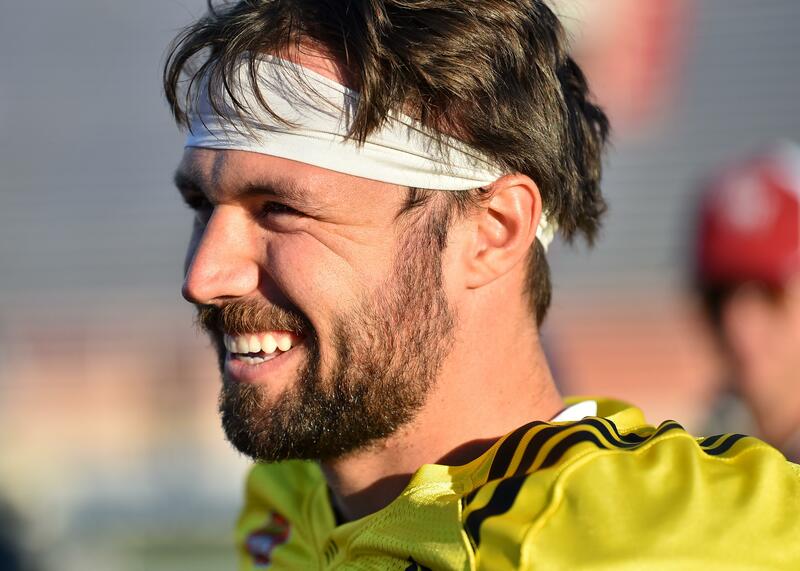 UPDATED: Thu., Feb. 7, 2019, 10:16 p.m.
Gardner Minshew took a break from his rigorous pre-NFL Draft training regiment in Florida to collect the Male Sports Star of the Year, presented Thursday by the Seattle Sports Commission at the MTR Western Sports Star Awards. The Washington State quarterback beat out a field of male sports icons from the Seattle area, including Seattle Seahawks wide receiver Tyler Lockett, Seattle Mariners right fielder Mitch Haniger, Seattle Sounders coach Brian Schmetzer, Washington Huskies linebacker Ben Burr-Kirven and Seattle Seawolves rugby standout Phil Mack. According to WSU Director of Athletics Pat Chun, it’s the first time a WSU athlete has been recognized as the Male Sports Star of the Year since the award was conceived in 1935. Other Cougars have won various awards at the same ceremony including Riley Sorensen (Inspiration Award), Bobo Brayton (Legends Award), Bob Robertson (Keith Jackson Award), Keith Jackson (Keith Jackson Award), Steve Gleason (Paul Allen Award) and Pete Rademacher (Sports Star of Year, 1956). The Male Star of the Year trophy is just another for Minshew’s collection. The QB also won Pac-12 Offensive Player of the Year and the Johnny Unitas Golden Arm award. He was a finalist for the Walter Camp Player of the Year, the Lombardi Award, the Davey O’Brien Award (nation’s top quarterback) and the Manning Award (nation’s top quarterback after the bowl season). WSU had another representative, women’s soccer standout Morgan Weaver, at Thursday’s ceremony. Weaver was up for the Female Star of the Year award after scoring 13 goals last fall and earning All-Pac-12 Region first team and All-Pac-12 first team honord while leading the Cougars to their second NCAA Tournament appearance. Published: Feb. 7, 2019, 10:10 p.m. Updated: Feb. 7, 2019, 10:16 p.m.